When making this dish, usually whole or milk fish slices are fried then served with adobo-like sauce with fermented black beans. I make mine with fish fillet and skipped the frying part. It’s easier, quicker and healthier. The recipe below is for 3-4 persons, feel free to adjust to your own taste or family size. Lightly season fish fillet pieces with salt and pepper, set aside. Heat cooking oil and sesame oil in a pan over medium heat. Add garlic, onion, saute until fragrant then add black beans. Cook for about a minute then add a cup of water; season with fish sauce ( or soy sauce if you want), and a little sugar and black pepper; bring to a boil then add the fish fillet pieces. Cook for about 5 minutes, then invert the fish fillet pieces and cook for about 3-5 minutes more. Make the slurry by mixing cornstarch with 1 tablespoon water then add a little of this to the pan ( you may use all of it or not depending on how you want the consistency of your sauce); bring to a boil, check the seasoning then turn off the heat. You may use bangus (milkfish) belly or boneless bangus fillet, but I suggest that you fry it first, it just taste better that way. 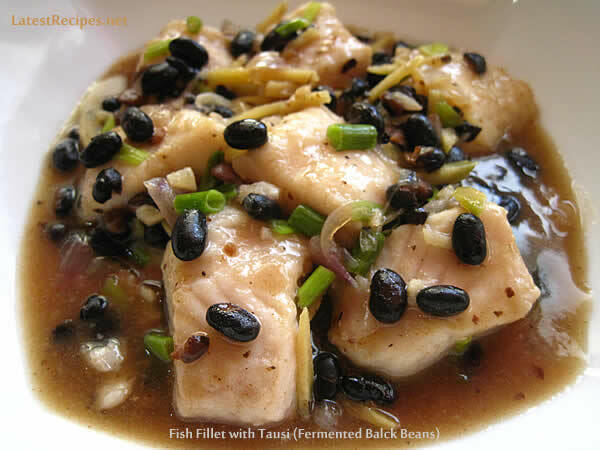 8 Responses to "Fish Fillet with Tausi (Fermented Black Beans)"
Just like you, my mom made this regularly when I was a child. Since she passed away 8 years ago, I’ve been searching for this recipe and I’m glad to find your blog. Thank you! Glad to have come across your recipe using fish fillet rather than the usual milkfish. Thanks again. Just made this for dinner and my mom, who is very picky, loved it!!! thankks for this easy and yummy version/recipe!!! I don’t cook fish much because I usually fry it and that’s very messy! This looks like another great way to cook fish! Funny how taste evolves, right? I always hated black beans too, but actually liked the flavor of the fermented (just picked around the beans)….